and the seats are comfortable. Bird dee enn ay, some pig, too. I'se jus free years olt an I kin wite my name. I want to be able to do my senior thesis next year as a Creative Writing Thesis at my college. I don't even know if they will let me. I am just asking now and just thought of it yesterday. If you are a praying person, would you be in prayer for such a thing. And if you are a think happy thoughts person, would you do that? And if you don't like me, would you sleep late tomorrow and not send any bad ju ju my way? keeping me oriented in the world, balanced. They have gotten loose. I am dizzy. when he is near, I find myself losing my upsides. He is smiling at me now. I am dizzy. I don't know if the doctor is right about my crystals. crystals. My girlfriends say I have rocks in my head. how many have stopped dancing? Mi comprensión del español es rudimentaria. Lo siento para los errores. When someone is arrested for a horrible crime, the wife or fiance is left as the person who must wipe up the mess. her life is liquid potential. and holding it in his grip. taking with it the fragile container. and told her he loved her, see her soon. crying over what has been spilt. Where is the poem today? to visit or even know about? and hop rails to camps by rivers. What made the poem leave? the pain? I am left just the same. or did I send him packing? He's been on his knees ever since. never went back for it. Re: Gonzales Memo 10/23/2009 page 24.
attempt to curtail those rights. As in...she tells her girlfriends and they say, "Oh, no!" Or, to be fair, he says he's getting married and his appalled bros spit Bud Light all over the foosball table. "Dude, Oh No!" These films seems to have a place in our lives and the sitcom has been of this genre for a long time. King of Queens, Everybody Loves Raymond, etc. As long as Seth Rogan still makes films, (and please, God, let it always be so, for I love them) then we need a name for this thing. Please feel free to spread this world-wide so I can be famous for something really important, seeing as how this poetry thing is not making me a million. There is no such thing as comfort. leech toxins into my body? left to turn sunlight into life? because I feel so bad. Written from a prompt, and not my own life. I don’t smoke. You will never see most of what I write. do not need the words on a page. written in my all over my face. I forgo the treasure, and thus avoid the curse. 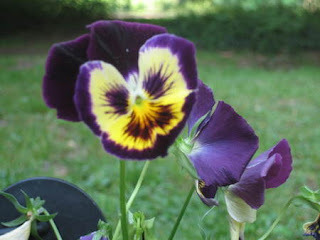 and she gave me a C.
I have loved pansies ever since. 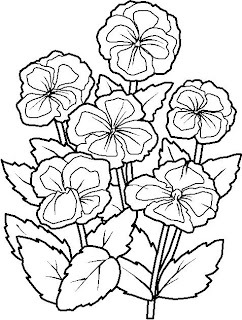 Print and color your own. Go ahead. You should. Any color you like. I have plenty of guile. This may be the truest thing I've ever written. remnants of my time in Germany. I just today wiped Texas sweat. rug for quarters. I could smell that, too. I am falling through to yesterday. I was a church-goin' girl. was pious enough for most. I was a Saturday church girl. made the quiet a balm. I was a Tuesday mornin' pulpit girl. Dragging a chair to see over. Delivering a sermon to the dust motes. I was a Thursday afternoon under the pew girl. I was a summer day altar girl. and for who you will become. for the late hour of eight. I want my love to see. he won't fail to see me. I pray for amnesia by fifty.